The world-record Donkey Kong score hardly seems like fuel for controversy, and in the larger world, it hasn't inspired any. But a microscopic look at the competitive arcade-gaming scene reveals high levels of anxiety, rivalry, and bad blood. The King Of Kong, a terrific documentary produced by Ed Cunningham and directed by Seth Gordon, details the rivalry between Billy Mitchell, an arcade-game legend since the early '80s, and Steve Wiebe, a nice guy who came out of nowhere to challenge the champ. That may sound like niche entertainment for nerds, but the story that develops—spurred partly by Mitchell's outsized personality and partly by the filmmakers' framing—becomes a hilariously universal story of good vs. evil, with [necessary spoiler ahead] the challenger coming out victorious. 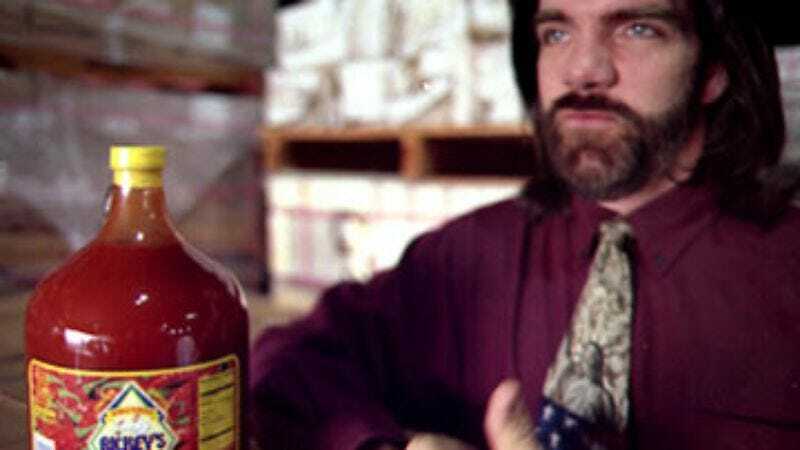 The story didn't end with the movie, though: Billy Mitchell, a successful restaurant owner and hot-sauce mogul in Florida, unsurprisingly took umbrage at the way he was portrayed. Though the beginning of the film paints him as a hard-working businessman who bettered himself via the same principles that made him good at gaming, it quickly casts him as a man who a) may have sent minions to examine his rival's game console, b) won't face a worthy opponent in a live match, c) may have cheated to keep his title, and d) is generally self-absorbed and awful. To what degree those things are true is a matter of debate. While Mitchell claims to this day that he hasn't seen the movie, he insists (in the few interviews he's given) that he was portrayed unfairly, and that the film is inaccurate. That's where The A.V. Club was willing to leave things—with an excellent documentary that, like all documentaries, can't possibly paint a completely accurate picture. Until about a week before the DVD release of The King Of Kong, when Billy Mitchell called our office. He was ostensibly just thanking us for ordering some of his hot sauce—and looking for our suite number for the shipment—but after I'd chatted with him for about 10 minutes, I asked if he'd like to continue our conversation, and make it an official interview. He agreed, and an hour of sometimes-pointed, sometimes-rambling conversation followed. To his credit, Mitchell is well aware that a Donkey Kong score isn't the most important thing on earth, or even in his life. But he's at least slightly bitter—and heartily determined to get his side of the story across. He comes across as friendly but almost amazingly self-centered, and a good deal more charming than Kong lets on. (Some of the DVD's bonus footage offers a better glimpse into what may be the "real" Billy.) He had plenty to say about specific points the movie raises—for instance, he says that in one key scene, the filmmakers edited out several seconds to make it look like he snubbed his nice-guy rival. In the interest of fairness, The A.V. Club tracked down Ed Cunningham and Seth Gordon to respond to some of the allegations. And the saga continues. What follows is two separate conversations that took place about a week apart, the first with Mitchell, and the second with Cunningham and Gordon. They're edited together for the purposes of clarity and flow. Billy Mitchell: You see me in the movie, and I'm wearing different types of patriotic ties. You saw the movie. What impression did the movie give you? And then I'll tell you the real truth. The A.V. Club: Well, the movie clearly makes you out to be the bad guy. Or do you mean specifically about the ties? BM: Did I come across like a staunch Republican, or like a NRA guy or a 9/11 guy, or something like that? The truth is, I started wearing those ties to competitions in 1999, because in the race for a perfect game of Pac-Man, there was another guy, a counterpart from Canada who's really good, and we were in our race, in our quest for a perfect game. He called himself Captain Canada, and he actually wore a Canadian cape, a flag. I just wasn't gonna be that goofy. The American flag tie's about as goofy as I would go. Sometimes interviews take a funny angle like that. Sometimes they want real serious questions about truth and lies and deception. And sometimes they just want the humor, the funny stories, and that's fine, too. And whatever you wanna do is fine. AVC: What's your honest assessment of Billy as a person? Is he a bad guy? My feeling after speaking with him is that he's kind of an egomaniac, but not a terrible person. Ed Cunningham: My on-the-record comment is "No comment." It's not our job to stamp someone and say that they're this or they're that. All of us live in gray areas, so, depending on your point of view of the film… Everyone's had different reactions to Billy in different ways. It's not up to us to judge what's on the screen, that's for the audience to judge. AVC: Did the film do a good job humanizing him? The extra footage on the DVD makes him out to be a nicer guy than the actual film. EC: Here's what I'd ask you to do, and it's kind of a ridiculous ask: Go back and watch the film again, because for whatever reason, because of what happens at [arcade] Funspot and then what transpires at Guinness, people kind of forget everything that was said at the beginning of the film about Billy. We spend the first 20 minutes of the film talking about how great Billy is, that he's got a great business, that he's used gaming to influence the rest of his life, to seek perfection with his family, with his business. That he bought and delivered a Q-Bert machine to [an elderly gamer] and sent her to Funspot. All of that stuff is covered in the film. It's almost like those things are forgotten as the story unfolds. AVC: Did you make conscious editing choices to set up a clearer good-guy/bad-guy dynamic, though? EC: Our goal was to represent them as truthfully as we witnessed them. Seth Gordon: I would say to represent it as it unfolded for us, in the sense that when we first met Billy, he was amazing, and everyone talked about him like he was amazing and perfect, and this sort of gamer of the century—there was a whole sort of rehearsed legend of Billy that we were very persuaded by, and very excited by. And when we were putting the piece together, we arced out our own experience of him, including, as time went on, the sort of hypocrisy of his actions. Not because we were interested in painting him in one way or another, just showing what we witnessed. Also, we were part of an elaborate chess game that he's been playing for 20 years with this group of guys, and we were uncovering stuff that I don't think he wanted uncovered. That's a really interesting puzzle to pick apart as a documentarian. BM: You can't send me a copy of the movie. Number one, it's not out on DVD [Editor's note: This interview was conducted before the film's recent DVD release. ], so what you got, you can't send to me. I could have gotten it a long time ago illegally. And I'm not gonna do that. But I think you're gonna have a hard time believing the fact that I kinda know everything about the movie, since every day I open my computer and reviews are forwarded to me, including video clips and all that. Plus, I got a good memory. BM: Okay, I'm ready. You're gonna ask me about the scene where I walk behind Steve. BM: Do you believe that I actually told you the question you were gonna ask me? So find humor in that, and go ahead and put it in your review. AVC: I'd guess this is a question you're getting a lot. BM: Either that, or I can read your mind, and you should hang up the phone quickly. Recall the scene in your mind. I'm walking with my wife—my trophy wife, which we'll talk about later. Um, what part of the country are you in? Chicago? Is that where you were born? Or where you grew up? AVC: I grew up in Milwaukee. BM: Very good. That plays a point later… We're on the record here so, I'm gonna watch what I wanna tell you. Are we on the record? BM: After spending a night out with my family, and dropping off one of the people who was participating in the contest there, I went to drive away, and my wife said, "You don't wanna go inside?" And so we walked in, and Ed Cunningham put the microphone on me. I didn't have any objection to that. I wouldn't—I mean, I don't have anything negative, period. Walking into the arcade, I went game to game, and at each game, I reminded my wife who the person was that was playing. One of the very first games—I don't know that it was the first, but it was one of the first—was Steve playin' Donkey Kong. And as I walked past him… Now you've got the movie in your mind, the camera is looking at me from behind or from the front? As I'm walking toward him. BM: You've gotta watch this movie, man! I'm givin' you these test questions! Okay, so the camera's watchin' us, and as we walk past him, this guy in the movie [Sarcastically.] who I've never met and I've never even said hello to, because I'm so nasty and arrogant… As I was just about behind him, he turned and he said, "Hi, Billy." Okay. You don't really—somebody you've never met—would you just say "Hi, Billy," that casually? Then it cuts from a perfectly good camera angle that's following us to the opposite side, where me and my wife continue walking, and I say something to the effect of, "Some people, I don't wanna spend too much time talking to." Is that what you're talking about? BM: Okay. Now this is what you do for a living? I'm only being funny here to drive a point home. I don't want you to put across that I was mean to you, because I'm not, I'm happy here. But let's think of this: This is what you do for a living? Now I'm gonna say it again, and you tell me what this means: "Some people, I don't wanna spend too much time talking to." You don't hear somethin' in that? AVC: I'm not getting it. You'll have to let me know what I'm missing. BM: I obviously stood there and talked to him. "Some people, I don't wanna spend too much time talking to." That's why they cut one camera angle to the other, 'cause when I stood behind him, and I waited for the precise moment, knowing Donkey Kong… You know where the monkey falls down on its head? You've got like, maybe 10 seconds of little rhetoric that you can, whatever, without disturbing somebody? And I reminded my wife, "This is Steve, remember we met him? He's the guy from Seattle. He's the other Donkey Kong guy." She goes, "Oh, yeah." I go, "How they treatin' ya?" That—my line to him is, "How they treatin' you," or "How is it treatin' you?" And he said, "Not good." And I go, "No?" He goes, "No, I just can't get it together," and he didn't get a good score that weekend. And I said, "All right, well, hang in there." And I walked away. AVC: And you're saying they cut that out, right? None of that's actually in the movie. BM: Right. So what they did was, he says, "Hi, Billy," cut! And then it's: "Some people, I don't wanna spend too much time talking to." If I stood there and talked to him and his guy died, [people would say] "Look at this: He can't even let the guy play in peace." You can see that angle, right? I didn't wanna stand there, I didn't want him to feel intimidated, I didn't want anyone to think that I was stealin' his secrets. AVC: So you didn't spend much time talking because you didn't want to disturb him? BM: Right. But why don't you ask the filmmakers if you can see the raw footage? They won't show it to you. But I think it makes a great movie, and really, if somebody loses sleep over it, give me a break, it's a video game. Ed Cunningham: Yeah, no, that didn't happen there. It didn't. At that moment, what we show is exactly what happened. AVC: With no time break? EC: No. There are all these conspiracy theories… Obviously, it was a small venue, and we had three or four cameras. And of course, if Billy's walking in, we're gonna cover it from three or four different angles, because that was the story. So that scene when he walks by is just a multi-camera shot, where we cut between angles. I've read claims that we had an actor dub in Bill saying, "I don't wanna spend too much time with certain people here." Really? That's what you're claiming? But no. He didn't stop. They did a whole lap, they were in there for like 20 or 30 minutes, he and his wife, and then on their way by, his wife actually stopped, and she engaged Steve in a conversation. She saw Billy's name up on the placard, and said, "Hey, why aren't you playing?" And he made a quick comment to the effect of, "Oh, that's a misprint." A friendly back-and-forth is not what happened. AVC: He says that he was trying to not disturb Steve, and that's what he meant by not spending "too much time," not wanting to psych him out. SG: That's very generous of him. [Laughs.] Not to derail the game with his magnetic force. He absolutely did not talk to Steve in any way. EC: Our goal was just to represent the tension that we felt in that room. I mean, the temperature in that room changed drastically, and we just hoped that we could present it as such. What he said is what he said. Does he want us to subtitle it and say, "This is what he meant"? I just know that that's what he said. We tried to represent that moment, as we tried to represent the whole thing, as truthfully as we witnessed it. BM: Yesterday, I get a phone call. I'll give you the phone number if you want; you can call the person. "Hi, is Billy there?" I'm on the other line, but I go, "Sure, who's calling?" "Steve Wiebe." Well, first of all, they said "WEE-be," which leads me to believe it's somebody who knows something. [Laughs.] And I says, "Yeah, hi, Steve, how ya doin'?" He goes, "Good." Click. He hung up on me. It wasn't him. This call was from Indiana. I'll give you the phone number if you want. You can put it through the 411 reverse and see what you learn or whatever, I don't know. AVC: But have you actually had conversations with the real Steve? BM: So if Seth Gordon once again in an interview says, "Billy Mitchell and his minions have started a smear campaign against the film…" I mean, where have I said anything negative about the film? I don't! I'm sure it's entertaining. I guess that's the best thing that can be said. [Steve] and I had three very friendly phone calls, um, each lasting more than an hour, on three different occasions. Not recently. Not at all recently. This was before he went to San Jose. I invited him to the Classic Gaming Expo, 2004. I invited him there, and I went up to speak onstage, as I do at each expo there. When I went up and spoke onstage, I called him to the stage, in order to honor him. I unveiled the poster in his honor, honoring his accomplishments. I did that in 2004. He was onstage with me. And I'm sorry to tell you that you can't see that, 'cause they forgot to put that in the movie. The pictures of me onstage with him, the posters, I think even film, are available, you're welcome to look at 'em. Do you really wanna go this deep? I mean, I can really shovel it at ya. But the thing is, like, what'd make me unhappy is, I give you all this, and all you do is state it in the paper. I mean, if you wanna know about it, then you look at the pictures. Then it's not he-said-she-said. Then you could ask Steve about it if you want. It's not "Billy Mitchell claims." It's "My research shows me." You know what I mean? I don't wanna be foolish, and, ya know, entertain you with this and then be made to look silly, you know? I read your reviews, "These two guys who obviously hate each other." That's absurd! I don't know him well enough to hate him. It's a video game. I wouldn't hate him over a video game. BM: I last played Donkey Kong in July of last year, when I got the world record. I did it as a favor to a friend who was participating in the convention in Orlando. They asked me to go, and I said no. That was in August. I said no in September, no in October, no in November. In December, they said that if I go there and I play, that they'll send my family, too, and we can have a vacation out of it. I said yes, but they had to donate $1,000 to a charity of my choice, which they agreed to. Sometime in January or February, I actually bought a Donkey Kong off eBay because I don't own one. I don't own any video games in my house. None. So in preparation for the convention, I practiced, played a little bit just to be able to show off and be entertaining. And things kinda came together really good, and about a week before I went there, I thought, "Wow, man, this fell back together good." So I went to the convention, and three weeks before the movie came out, I beat Steve's score, which sort of debunked what they did. I think I aggravated 'em. Not Steve, I think I aggravated the movie people. I guess they'd rather I didn't do that, but I did it, and I haven't played since. Prior to playing that July, I hadn't played since 2004, when I got to the kill screen and set what was thought to be a new world record in Milwaukee. So the idea that I had played it intensely since 1982… Gimme a break. I went 13 years without playing a video game at all, from around '87 to '99. AVC: How much of your day-to-day is taken up, since the movie came out, with talking to people about it? BM: Before the movie came out, there wasn't a day would go by that I didn't have somebody say hi or recognize me from video games as a whole. Matter of fact, if a day did go by, I'd say, "Phew, nobody said anything to me." Now that the movie's out, it's the same thing. Before, it was mostly, "That's the video-game guy," or "That's the Pac-Man guy," and it's still dominantly, "That's the Pac-Man guy." But some of it is, "That's the Donkey Kong guy." As far as sayin' hi to people and things like that, it does happen on a daily basis, sayin' hi to kids who come in the restaurant or play with my children. Everything that's face-to-face is always very, very friendly. I get e-mails and such that would turn your stomach. People, they surprise ya! [Laughs.] With how strong their emotions are. I guess that's because it's an entertaining movie. And some people, like yourself, find it entertaining, great to watch and be humored, and some people take it as a whole lot more, I guess. AVC: And you're interested in setting the record straight wherever you can? BM: For every hundred interviews that I have the opportunity to do, I just once in a while do it, 'cause somebody's polite on the phone. Like you. The interviews I've done in a year, I can count on both hands. It's just a video game, and it's brought me a lot of fun, the experience as a whole from 1982 to now. I've been to 48 out of 50 states. I didn't get to Hawaii yet, and for whatever reason, I haven't been to North Dakota. I've been in Canada, I've been in Europe, I've been in Asia. How can it not be a great experience? But every year that ticks on the calendar seems to deal me more and more responsibility in the real world, and less and less available for recreation. AVC: So if somebody beat your new record, would that inspire you to go do it again? BM: August 17, 2000, Tim Sczerby beat my score. I don't know if you know that. I wasn't the world-record holder [as the movie implies]. That's just a big sham. He beat my world record, and I called him, I congratulated him. I guess you could say we talked Donkey Kong on a higher level. And he went back to his life, and I went back to mine. That was in the year 2000. Steve Wiebe came along in 2004 or 2003, and he submitted a score of 947,000. And when he submitted that, he had the record. During this time period, I had never played or attempted to beat anybody's record. In the movie, when you show [Steve] getting a million six, and the score is pulled down, and it goes back down to 874,000—what happened to the 937,000 that Tim Sczerby had? And what happened to the 947,000 that Steve Wiebe had? They just crossed that over, but it made a better movie. If you really want the facts, I'll give 'em, but to answer your question, no, it's not that important to me. I mean, it wasn't important then. I did it for the charity, and I have done many scores at many times that, had I chosen to videotape them or submit them, they would have been a big deal. But as the years go on, the big deal is the wife and kids. Steve Wiebe reaches the legendary "kill screen" at FunSpot, and Bill Mitchell's "spy." AVC: You have the record now, correct? And you achieved it live? BM: You ask good questions, man. You been doing your research? Considering all the controversy surrounding Steve's score and all the fuss that was made about the score, I didn't wanna be a part of that. That's why in the movie—search your memory banks or watch the movie again—never, ever do I say a bad or negative word about Steve or anyone. It's just not part of my nature. So I didn't wanna be a part of the controversy, and I thought, "Well, how do I drive this point home?" And so I bought a game, I sent the board to Nintendo—this is all documented—they verified its authenticity, that it was a real board and had not been tampered with. It was sent to the manager from GameWorks and a notary public, who were there and plugged it in at the event in Orlando. So the notaries were there. The game was locked up and the manager of GameWorks kept the key with him, and the Twin Galaxies senior referee Todd Rogers was there. If you follow the rules, you have a senior referee there, a senior referee witnesses it, period. End of paragraph. Score verified. AVC: But you did more than that. BM: The game was videotaped, and then the overall area of me playing was taped. Once the score was done, the GameWorks guy came back with the key, opened the cabinet, then put it in a box and they sent it back to Nintendo, who re-verified it as the same board, still authentic, untampered with. Lastly, I took the videotape of the game and sent it to two referees, the same referees that had viewed previous tapes, and they verified the authenticity of the tapes. I can't really do a whole lot more than that. AVC: You say it's just a video game, but you took it pretty seriously. BM: I didn't want to cause any rhetoric or any heartache, and without kidding you, and this part is the touching part for me… People in the movie, like Walter [Day, video-game scorekeeper], who are very giving of their time, for a labor of love, people in the movie who are made to look corrupt, incompetent, or manipulated, they take a lot of flack that they don't deserve. They can't take any flack on this. BM: The two guys who went to Steve's house, they called ahead of time, they were told when to be there. He was late getting home. The grandmother opened the garage, they let 'em play. Nobody broke into his house. And now Steve Wiebe says that. He says, "No, they were pleasant," and now when they do interviews, they don't say "the goons who broke in," like the movie would have you believe. They just say "the two guys who visited Steve." And I appreciate that, because I have it on my conscience that otherwise good people are criminalized, and they shouldn't be. It was a fun thing, and if you sensationalize something for the sake of Hollywood, I think that's fine. I don't think it's a big deal. I think the interviews, afterwards, they talked to Cunningham, and they talked to Seth Gordon, and they openly say that these goons came in and broke into his garage, these two spies came in and tore his machine apart. They didn't tear his machine apart. Steve opened it. Now Steve says that, and I appreciate his character on that, and the fact of the matter is, it's not necessary to say those things in an interview to sensationalize the movie. The movie sensationalizes itself. They don't have to do that. And it's better that they don't. AVC: Have you spoken with Seth Gordon after reading these sorts of interviews? BM: Seth was behind the camera, and I obviously did interact with him, but without kidding you, if Ed Cunningham came in and sat in a restaurant and started eating and I walked past him, I'd know who he was. If Seth Gordon did, I would not, and it's not a slight to Seth Gordon. He was not the one that was steering the cart. It was Ed Cunningham, and Ed Cunningham was the one who organized things, and all that kind of stuff. Seth Gordon does these interviews and comes up with these things he says out of thin air, these quotes he says I'm saying—they're beyond me. I have no idea. I haven't had a conversation with him. You know, the idea that Billy Mitchell is bitter about the movie… Says who? I think it's funny. I think it's humorous. The closest thing to bitterness that I have is, I think it's lousy that they criminalize people. You know, they're the ones who have to live with that. But the fact that myself and others were duped, that's no fun. We were led to believe something else about the movie, and, oh well. Ed Cunningham: We could have spent 25 minutes dissecting how they got in [to Wiebe's garage], and how they were asked not to come in. But the point is, two guys showed up at this guy's garage, unannounced. They didn't call, and I don't care what anybody says, they went at the behest of Bill Mitchell. Three people say that. The whole thing started, honestly, when we just kind of, in editing, referred to it as "the break-in." They didn't break into the garage, nor does the film say that they broke into the garage. And everyone was upset, and I understand that it had come out that we had said in a Q&A; or something online that it was a break-in. I get that, and we've pulled back from that. We don't refer to it as the break-in any more. But the overall fact is, two guys showed up at Steve Wiebe's garage unannounced to look at his machine. AVC: You thought it was going to be a more direct documentary about video gaming? BM: The truth is, I never knew it was even going to be about Donkey Kong, I thought it was competitive video gaming as a whole. But the truth is, none of us are ever mean. None of us are ever vindictive, and we've never had a mean-spirited movie or story or film done about us, so this was a first. All of us, a couple of us in particular, for 22 years now, have avoided interaction with Mr. Awesome, and it was clearly stated, "I'll do what you need me to do, or we can talk about whatever you want me to talk about, I'm not going to talk about him. And if you're going to include him, I'd just rather not participate." And it was openly said, "No, we aren't going to," and "Not a chance," and they did anyway. Oh, well. That's really the main crux as to why I decided to distance myself from participating in any promotions or anything like that. As far as the movie, it's a lot more fun to play the bad guy, believe me. Are you married, or do you have a girlfriend? BM: Well, let's pretend like she watches soap operas. She'll tell you her favorite person is the really bad girl or bad boy. So, it's kinda fun. The incredible, unbelievable story of Mr. Awesome. Ed Cunningham: I met Steve four days after the guys showed up at his house to check out his machine. So it was a really opportune moment, but you know, Steve's just kind of a regular guy, and we didn't know if we could hang a whole movie on him. And then we went down and met Billy and I was like, "Oh my God, this guy's awesome." He's just an amazing, amazing guy. We were chasing about four or five different stories, there was a great story going on with Ms. Pac-Man, with this Jamaican immigrant who worked for his dad's construction company in Queens. But every time we showed up, something strange and fascinating was happening with Donkey Kong. AVC: Billy says his greatest concern was the inclusion of Mr. Awesome in the film. Presumably there's more to their history than the movie goes into. EC: The movie pretty clearly states that Roy is jealous of Billy, has been since the mid-'80s, and will go to the ends of the earth to try to hurt him. In a 35,000-foot statement, that's the story. SG: Although not physically harm him. Conspiracy theories and Mr. Awesome. AVC: Apparently, Seth Gordon and Ed Cunningham are working on a feature-film version of the story. Did you know anything about that? AVC: So if they came to you and said, "We're doing a remake. And we want to have a character named Billy Mitchell, and it's about—"
BM: They already have the paperwork to do that. I signed the paperwork to do that before the documentary came out, and I was duped. I suppose they'll get away with it. AVC: That's not something you'd have enough interest to go to court about? Ed Cunningham: Our goal would be to keep [a feature-film version] in the same tone as the doc. That's one of the reasons we were so excited to end up at New Line, because they have that same vision for it, that it won't become this broad, kick-in-the-groin comedy. So that's our goal. The ending in the doc is fairly complicated, and you have to consider when you go to a scripted version, you have to be open to the idea that it may change some. As far as Billy reclaiming the record, I don't know how that's going to be dealt with. AVC: And you already have permission to portray Billy in a feature film, right? EC: Yeah, we have his life rights. [Laughs.] Complicates things, doesn't it? AVC: Billy's understanding of this is that the exclusion of Mr. Awesome applies to a feature film. Is that true? EC: It's not our position to talk about the legal side of things. That would be completely beyond our scope to comment on. SG: But I think we can generally say, the degree to which Billy wants to remove Mr. Awesome from the historical record, in every form, is definitely true. [Laughs.] Is that fair, Ed? Ed Cunningham: It's been an incredible lesson on how, when people have a vested interest, the truth is always going to be slanted toward their opinion. We've tried a couple of times to sit down and hash out everything we learned through this process factually, and it's nearly impossible. If you want to have some very intense reading, go on some of the blogs and read any entry from [video-game referee and King Of Kong participant] Robert Mruczek and his claims on what happened and how. It's so mind-boggling, the level of detail that people have gone to, to try to say what the truth is or isn't. It's really a fascinating study. There's truth everywhere. Seth Gordon: Yeah, the Rashomon of it. What's fascinating is how high the stakes are for such a thing. They put so much effort into something that to most of us seems relatively inconsequential. What's worth getting upset about, really? Amazing 2003 MTV interview with Billy Mitchell. BM: Hey, you didn't ask any real tough questions. AVC: I didn't know we were doing an interview today! BM: Well, you're not intimidated by the movie, are you? You don't look over your shoulder and think that I'm there? AVC: [Laughs.] Are you right behind me? BM: No, but I will be. Again, I see the value of Hollywood, I really do. I don't think it's necessary for—you can read the interviews, you can be at the Q&As;—I don't see the necessity, when the game is over, to do things they've done that are mean-spirited. AVC: Are you selling more sauce since the movie came out? BM: Well, let's just say I haven't hit $50 a week yet. I do talk to a lot of people, and when I have a review or something sent to me, like when somebody sends me yours, sometimes you can just click on it and send an e-mail. Sometimes there's a phone number. I never ever, not once, miss contacting, saying thanks, saying "That was funny," or whatever the case is. Sometimes the reviews are funny. Sometimes they're insightful, and I learn things that I otherwise didn't know. Very often, I get responses back, and they're usually: "Well, I didn't mean to offend you." You're not offending me, you're reporting what's just on the screen. That's the way it is. More often than not, it leads to a conversation without an interview. But I'm very cautious, as you can hear in my voice, I do not speak ill of people. It would come back to bite me, and in 25 years, I've never done a negative interview, and I'm not going to do one. AVC: Well, thanks for all the insight, I appreciate it. And we're looking forward to the sauce as well. BM: Well, ask some tough questions the next time! AVC: If I'd known we were going to speak today, I would have thought of some. BM: Hang in there. If you're ever down here, you can stop and say hi.